[00:00] Background Loader: Error: No valid files were found in the directory! Thanks for reporting your fix to the problem; Too many others simply report: "I fixed it." and fall off the face of the planet. There's a new 'Video' and 'Terrain' folders in Data. Does this need to be updated to account for those bk2 files inside? It's either this or Imperfect Ultrawide which is leading to a black/blank intro and menu screen. *edit nvm, removed interface, meshes, textures from Data folder and any baka files created as part of Imperfect and that's solved things for now. Does anyone know how to add the archive2 path to the baka thing? I've never used the creation kit before so idk where it's located to path it to somewhere. Apparently they changed the archive names again with today's patch. Will BAKA need updating? No, the archive names that changed are under a different configuration setting than the one that Baka uses. 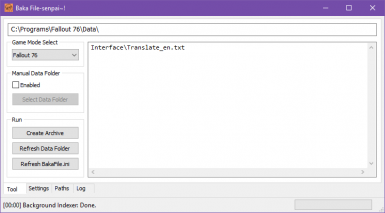 can i mod condition clips with this to add this mod? 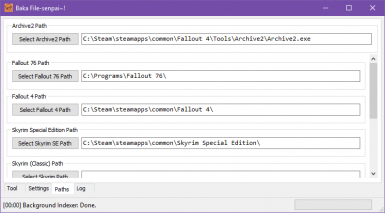 https://www.nexusmods.com/fallout4/mods/13564 or will i need more since there are more status effects? 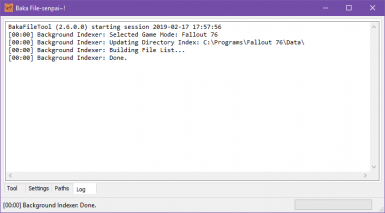 When I select fallout 76 it doesn't work and in the bottom left corner of the application it says " [00:00] Background loader: Error: No valid files were found in the directory"
Have you installed any mods yet? i dont get it, is this not a mod installer? what does this do exactly? @sgtAngelGR -- This is not an AIO Mod Installer, like Vortex, Mod Organizer (1,2), etc. 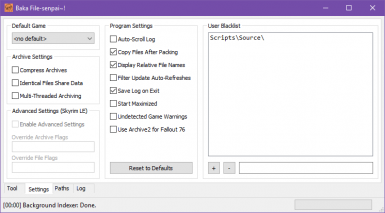 This is a TOOL to efficiently utilize a mod's respective loose files for Fallout 76. 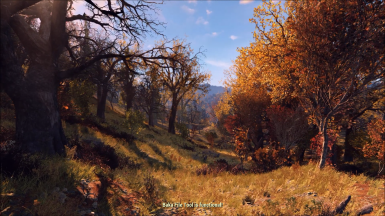 @sgtAngelGR - Nexus Mods 101: READ THE DESCRIPTION! Can we get a settings option to default to a specific game? what do i need for the custom.ini?